I received an email from the NZ Vegetarian Society, RE the calls for larger cages/banning *CERTAIN* cages used for keeping pigs for their meat. "Your Say Matters - Say no to pig cruelty" Campaign. Why would an actual *VEGETARIAN* society ask for welfare reform when it comes to "meat animals"? Why would the Meat Boards care what Vegetarians want them to do, its not like a Vegetarian will buy their product! Animal Welfare reforms are not what we should be promoting. 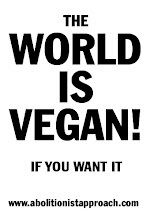 We should promote Veganism, to help all our animal friends.